Whenever I'm short of time I reached for a Breton top. I own quite a lot because you can never have enough stripes in your wardrobe! This Boden beauty is my latest addition. I love the glitter spots that give it a fun twist. I wasn't able to fit into these River Island jeans a couple of weeks ago so I was jumping for joy when they did up this weekend. I bought these Aldo wedges when I spotted them on my cousin in Ireland last summer. I was heavily pregnant at the time and living in flats but I knew they were a good investment. This is the first time I wore them and they are so comfortable. 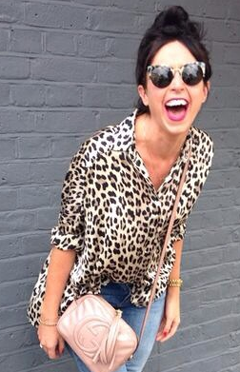 I'm a massive fan of mixing prints and stripes and leopard print is one of my all time favourites!